Dysregulation of the T cell-dependent Ab response can lead to numerous immunological disorders, ranging from systemic lupus erythematosus to B cell lymphomas. Cellular processes governed by MHC class II proteins play a major role in this response and its dysregulation. The extent to which processes controlled by the diverse family of MHC class I proteins impact such autoimmune and neoplastic disorders, however, is less clear. In this study, we genetically dissect the contributions of individual MHC class I family members and the pathological processes under their control in the systemic lupus erythematosus-like disease of BXSB.Yaa mice and B cell lymphomagenesis of SJL mice. This study reveals a powerful repressive regulatory axis comprised of MHC class I-dependent CD8+ T cells and NK cells. These results indicate that the predominant role of the MHC class I protein family in such immunological disorders is to protect from more aggressive diseases. The T cell-dependent Ab response is the culmination of multiple cellular and receptor interactions that result in high-affinity Ag-specific IgG Abs and long-term memory. Optimally, this response is finely tuned to maximize immunity while minimizing collateral damage to the host. However, dysregulation of the response can lead to the development of a spectrum of immunological disorders including the prototypic autoantibody-dependent disease, systemic lupus erythematosus (SLE), as well as B cell lymphomas of germinal center (GC) and post-GC origin. Proteins encoded by the MHC play important roles in both normal and autoimmune responses. MHC class II proteins are essential because they present processed peptides on APCs that are required to stimulate Ag-specific CD4+ T cells that drive B cells to mature and secrete IgG Abs as well as supporting CD4+ regulatory T cells (Tregs) that have suppressor functions (reviewed in Ref. 1). Less is known regarding the extent to which MHC class I proteins significantly impact these responses. The MHC class I protein family is large and diverse, and most members require association with the β2-microglobulin (B2M) chain for their cell-surface expression and function. The highly polymorphic, classical MHC class Ia proteins present a vast array of processed peptides and are critical for the development of CD8+ T cells and their TCR repertoire, which is required for discrimination between self and nonself. MHC class Ia proteins also serve as ligands for inhibitory innate receptors on NK cells. The minimally polymorphic MHC class 1b proteins serve both overlapping and unique functions. Those encoded within the MHC, QA1 in mice (encoded by H2-T23) and HLA-E in humans, provide both inhibitory and activating ligands for NK cells and CD8+ T cells (2–4). The more distantly related MHC class Ib protein, CD1D1, presents glycolipid Ags and is required for the positive selection and activation of invariant NKT cells that produce high levels of cytokines, including IL-4 and IFN-γ, which regulate immune responses in various diseases (5). Finally, the MHC class Ib family FcR, FCGRT (otherwise known as FcRn), plays a dual role. It greatly enhances the presentation of immune-complexed Ags by MHC class II molecules (6, 7) and critically regulates homeostatic serum concentrations of IgG Abs (8). To address the involvement of regulatory pathways controlled by members of the MHC class I protein family in autoimmunity, we focused our studies on the BXSB.Yaa model of SLE and then sought to identify parallels in the SJL model of B cell lymphoma. We first determined the influence of a deficiency in B2M, which is required for the expression of most MHC class I family molecules at the cell surface. Both BXSB.Yaa and SJL mice deficient in B2M exhibited a striking acceleration in mortality, indicating that the predominant role of the MHC class I protein family in these models was to protect from both forms of disease. We then genetically dissected the contributions of individual MHC class I family members and the pathways they control. The results reveal a powerful regulatory axis comprised of MHC class I-dependent CD8+ T cells and NK cells that normally operate to prevent BXSB.Yaa and SJL mice from developing much more aggressive immunological diseases. Interventions that augment this regulatory axis may therefore represent a general strategy for the treatment or prevention of CD4+ T cell-driven B cell-dependent autoimmune diseases and malignancies. All mice used for these studies were bred and maintained in a specific pathogen-free mouse colony at The Jackson Laboratory. To insure environmental consistency, all aging experiments were conducted in the same specific pathogen-free mouse colony. Every effort was made to minimize variation in husbandry, and the microbial status of the colony did not change over the course of the experiments. BXSB.Yaa mice carry the H2b haplotype, whereas SJL/J mice carry the H2s haplotype. Marker-assisted breeding was used in successive backcross generations of BXSB/MpJ.Yaa and SJL/J mice to produce stocks congenic carrying the null alleles or transgenes described in Supplemental Table I. All alleles were backcrossed onto the respective strain backgrounds to at least N11. Stocks homozygous for the mutations were identified by a combination of genotypic markers, serological typing, test outcrosses, and, when practical, documentation of predicted cell-surface phenotypes was confirmed by flow cytometry (Supplemental Table I). All experiments were performed at The Jackson Laboratory in compliance with Institutional Animal Care and Use Committee approved protocol 01022. Quantification of serum IgG1, IgG2a, and IgG2b from sera was performed as described (9). For anti-nuclear Abs (ANAs), sera were applied to HEP-2 slides (Antibodies Incorporated, Davis, CA) as described (10). Images were acquired with a Leica SP5 confocal microscope under uniform settings (Leica Microsystems), and ANA intensity was quantified using ImageJ software (National Institutes of Health, Bethesda, MD) with the RGB Measure plug-in (10). Negative and positive serum control samples provided with the slides were used to set the 0 and 4 values, respectively. Flow cytometric analysis was performed using conventional multiparameter procedures. Abs used were against CD3, CD25, CD21, CD122, Fas (553062, 559884, 553866, 552818, and 557653, respectively; BD Pharmingen), B220, CD8, ICOS, CD23, CD11b, Ly49C/F/I/H (103227, 100730, 313516, 101614, 101216, and 108207, respectively; BioLegend), CD4, Gr-1 (MCD0430 and RM3030, respectively; Invitrogen), CD44, CD62L, Foxp3 (27-0441, 25-0621, and 17-5773, respectively; eBioscience), and IL-15Rα (FAB551F; R&D Systems). Intracellular staining for Foxp3 was performed using a BD Cytofix/Cytoperm kit (BD Pharmingen). Flow cytometric analysis was performed on a 2-laser/4-color FACSCalibur analytical cytometer or a 4-laser/13-color BD LSRII analytical cytometer (BD Pharmingen), and data were analyzed with FlowJo software (Tree Star). Formalin-fixed, paraffin-embedded sections from tissues obtained at necropsy were stained with H&E or used for immunohistochemical analyses using Ab to CD138, B220 (553086 and 553712, respectively; BD Pharmingen), CD3 (MCA1477; AbD Serotec), and IgG (1030-01; Southern Biotechnology Associates). Histologic diagnoses were made using established criteria (11, 12). High m.w. DNAs prepared from lymphoid tissues were analyzed by Southern blotting as previously described (13). For IgH chain rearrangements, DNAs were digested with EcoRI and hybridized with the J11 JH probe (14). For TCR β-chain (Tcrb) rearrangements, digestion was with HpaI, and the probe was CTb (15). To screen for somatic integrations of ecotropic Moloney murine leukemia virus (MuLV), DNAs were digested with EcoRI and probed with the ecotropic-specific probe EcoSp, a 400-bp SmaI fragment (16). DNA was prepared from nucleated spleen cells using the RNeasy Mini kit (Qiagen), and the quality of the RNA was examined by Bioanalyzer (Agilent Technologies). cDNA was synthesized according to the manufacturer’s protocol (MessageSensor RT kit; Ambion). Quantitative PCR (qPCR) primers for each gene were designed using Primer3 software to map within exons. Each oligonucleotide primer was searched against GenBank via the BLAST program to maximize target gene specificity. Gene-specific primer pairs suspended in 3% sucrose were then applied to 384-microwell qPCR plates and desiccated in a miVac Duo Concentrator centrifuge (Barnstead/GeneVac). Primer pairs with high sensitivity and specificity were identified by qPCR amplifications of genomic DNA from BXSB mice. For expression analysis, cDNA and SYBR Green RT-PCR mastermix (Applied Biosystems) were added to each microwell, incubated for 30 min to solubilize, and reactions were run using an ABI Prism 7900HT (Applied Biosystems). Differentially expressed genes were identified using the global pattern-recognition algorithm (17). Oligonucleotide primers used for qPCR were: IgG1, forward 5′-CACCTCCCAAGGAGCAGATG-3′, reverse 5′-CCCAGTTGCTCTTCTGCACAT-3′; IgG2, forward 5′-CATCACCCATCGAGAGAACCA-3′, reverse 5′-ACACTGATGTCTCCAGGGTTGA-3′; IgG3, forward 5′-GTCATCCTCGCTCACATCCA-3′, reverse 5′-CAGCCAGCAAGACTGAGTTGAT-3′; Il4, forward 5′-TCAACCCCCAGCTAGTTGTC-3′, reverse 5′-TGTTCTTCGTTGCTGTGAGG-3′; Il10, forward 5′-CAGAGAAGCATGGCCCAGAA-3′, reverse 5′-GTCAAATTCATTCATGGCCTTGT-3′; Il17a, forward 5′-GAAGATGCTGGTGGGTGTGG-3′, reverse 5′-AGCCGCGGGTCTCTGTTTAG-3′; and Il21, forward 5′-GAAGATGGCAATGAAAGCCTGT-3′, reverse 5′-AGGATGTGGGAGAGGAGACTGA-3′. The log-rank test was used for survival analysis, with Bonferroni corrections performed for multiple cohort comparisons when applicable. The two-sided Mann–Whitney U test was performed for multisample comparisons, and the two-sided Student t test with the assumption of unequal variance was used for two-way comparisons. BXSB mice carrying the Y-linked autoimmune accelerating gene mutation, Yaa, develop a severe SLE-like disease that is critically dependent on T/B cell collaboration (10, 18–21). Development of disease is a consequence of epistasis between the autosomal genetic background of BXSB mice that predisposes them to chronic, late-onset autoimmunity and potent amplifying effects caused by Yaa (19). The disease of BXSB.Yaa mice is characterized by lymphadenopathy, splenomegaly, monocytosis, hypergammaglobulinemia, ANA, and severe immune-complex glomerulonephritis (commonly with anasarca), leading to premature death at an average age of 6 mo. To determine whether a generalized disruption of MHC class I protein function might impact the pathogenesis of this disease, we produced BXSB.Yaa mice homozygous for a null allele of B2m (backcross generation 10–12) and compared their survival to that of wild-type (wt) B2m+/+ controls. Whereas the mean survival of BXSB.Yaa wt mice was 32 wk, the mean survival of BXSB.Yaa B2m−/− mice was only 18 wk (Fig. 1A; for overall log-rank statistical analyses, see Supplemental Table II). These results demonstrated that B2M-dependent MHC class I molecules greatly extend the survival BXSB.Yaa mice, but, owing to the pleiotropic nature of B2M, did not pinpoint the specific class I proteins responsible for this phenotype. Survival of BXSB.Yaa mice: effects of a global deficiency of MHC class I molecules and selective deficiencies that affect class I-dependent pathways. A, Deficiency in B2M greatly shortens the lifespan of Yaa mice. Yaa B2m−/− versus Yaa wt, p < 0.001. 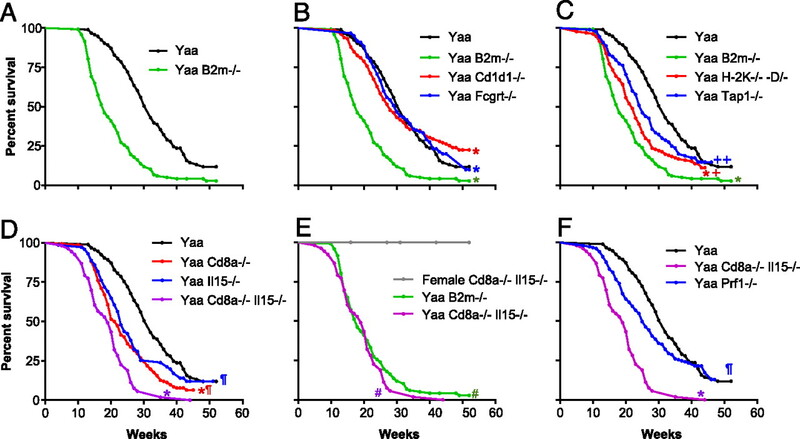 B, Deficiencies in CD1D1 or FCGRT have minimal effect on the lifespan of Yaa mice. Yaa Cd1d1−/− versus Yaa wt, p = 0.6, and Fcgrt−/− versus wt, p = 0.78. C, Deficiencies in H-2K/D or TAP1 shorten the lifespan of Yaa mice but less than a deficiency in B2M. D, Deficiencies in CD8α and IL-15 shorten the lifespan of Yaa mice in an additive manner. E, Deficiencies in both CD8α and IL-15 shorten the lifespan of Yaa mice to the same extent as a deficiency in B2M. Also shown is the survival analysis of BXSB Cd8a−/−IL15−/− female mice, which remained healthy through 52 wk. Yaa Cd8a−/−Il15−/− versus Yaa B2m−/−, p = 0.26. F, A deficiency in PRF1 results in accelerated early mortality in Yaa mice; late deaths are unaffected (overall, p = 0.13). See Supplemental Table II for cohort sizes and log-rank analyses. Bonferroni corrected significance values: *significant versus Yaa wt at p < 0.01, +significant versus Yaa B2m−/− at p < 0.05, ++significant versus Yaa B2m−/− at p < 0.01, ¶significant versus Yaa Cd8a−/−/Il15−/− at p < 0.01, #significant versus female Cd8a−/−/Il15−/− at p < 0.01. To identify the MHC class I molecule(s) that may be responsible for extending the survival of BXSB.Yaa mice, we first evaluated the MHC class Ib protein CD1D1 (Fig. 1B). The mean survival of CD1D1-deficient BXSB.Yaa mice was not significantly different from that of wt BXSB.Yaa mice. We then evaluated the potential contribution of the MHC class Ib FcR, FCGRT (Fig. 1B). Analyses of FCGRT-deficient BXSB.Yaa mice showed that their survival was very similar to that of the wt cohort. These experiments exclude appreciable impacts for CD1D1-dependent iNKT cells, FCGRT-dependent Ag presentation, and IgG homeostatic functions on the lifespan of BXSB.Yaa mice. To address whether the accelerated mortality of BXSB.Yaa mice deficient in B2M could be ascribed to failures in Ag presentation by MHC class Ia molecules, we assessed the survival of BXSB.Yaa bearing null mutations of both H2-K and H2-D (Yaa H2-K/D−/− mice) as well as mice with a null mutation of the transporter of Ag processing 1, Tap1, which is required for the loading of processed peptides onto H-2K and H-2D (Yaa Tap1−/− mice) (22). In considering these studies, it is important to realize that Yaa mice, either wt or bearing these mutations, all share the H2b haplotype. In contrast to the data obtained with mice that lack CD1D1 or FCGRT, the survival of Yaa H2-K/D−/− mice as well as BXSB.Yaa Tap1−/− mice was reduced compared with that of wt Yaa mice (25 and 23 wk, respectively, versus 32 wk for Yaa wt) (Fig. 1C). However, in both cases, the acceleration in mortality was not as profound as that observed in the B2m−/− cohort. These results show that classical MHC class Ia molecules as well as TAP1 peptide processing contribute to the disease protection observed in B2M-intact BXSB.Yaa mice. Given that mice deficient in H2-K/D and TAP1 have greatly reduced numbers of CD8+ T cells (22, 23), the accelerated mortality of mice carrying these mutations could reasonably be ascribed to a numerical reduction in CD8+ T cells. To more directly test for the potential contribution of CD8+ T cells, we analyzed BXSB.Yaa mice deficient in CD8α. The survival curve of Yaa Cd8a−/− mice fell between those for wt and B2M-deficient Yaa mice (Fig. 1D). These data indicate that CD8+ T cells were at least partially responsible for protecting BXSB.Yaa mice from more acute disease. The fact that the CD8α deficiency did not fully recapitulate the shortened survival observed with BXSB.Yaa mice deficient in B2M strongly suggests that B2M-dependent effector cell types distinct from prototypic CD8+ T cells must also be contributory. The cytokine IL-15 supports the peripheral maintenance of memory CD8+ T cells and the development and maintenance of NK cells (24, 25). The survival of BXSB.Yaa mice bearing a null allele of Il15 was reduced compared with that of wt controls, consistent with an important contribution of IL-15 to disease resistance (Fig. 1D). If IL-15 was required solely to support the maintenance of the CD8+ T cells described above, one could predict that the survival of Yaa mice lacking both CD8 T cells and IL-15 would be equivalent to that observed when Yaa mice were deficient in CD8 T cells or IL-15 alone. To address this possibility, we determined the lifespan of BXSB.Yaa CD8a/Il15−/− double-knockout (DKO) mice. Unexpectedly, the lifespan of these DKO mice was even shorter than that observed with the single knockouts (KOs) (Fig. 1D) and was indistinguishable from that found for B2M-deficient Yaa mice (Fig. 1E). Importantly, female CD8a/Il15−/− mice that lack the Y chromosome remained healthy and survived >52 wk, indicating that the shortened survival observed in male DKO mice was dependent on the Yaa locus (Fig. 1E). These data indicate that the disease-protective effects of B2M-dependent MHC class I proteins could be attributed entirely to the additive functions of CD8+ T cells and IL-15. Knowing that IL-15 supports NK cells as well as memory CD8+ T cells, the results are most consistent with the activities of a regulatory axis comprised of CD8+ T and NK cells in counteracting the pathogenic processes responsible for the death of wt BXSB.Yaa mice. Effector functions of CD8+ T cells and NK cells include the release of perforin, causing the lysis of target cell populations. To determine if perforin contributes to protection against accelerated mortality in BXSB.Yaa mice, we examined the course of disease in mice with a null mutation in Prf1, the gene that encodes perforin. The early survival of Yaa Prf1−/− mice (Fig. 1F) was reduced compared that of wt Yaa controls but did not reach statistical significance overall. Perforin-mediated lysis may therefore contribute to the lifespan extension conferred by the regulatory CD8/NK axis described above, but other undefined mediators of suppression must also be operative. The striking decrease in the lifespan of BXSB.Yaa mice with mutations that cripple certain MHC class I pathways could be explained by the abrogation of normally potent suppressor mechanisms or the unleashing of aggressive pathological processes atypical of the canonical BXSB.Yaa disease. To distinguish between these possibilities and more generally understand the impact of MHC class I-dependent processes on disease development, we evaluated the effects of deficiencies in DKO and B2m−/− mice on a series of immunological features known to distinguish BXSB.Yaa from autoimmune-resistant BXSB.B6Y mice. We first compared wt and DKO Yaa mice and B6Y mice for age-dependent changes in the levels of serum IgG1, IgG2a, and IgG2b. Compared to sera from BXSB.B6Y control mice, the levels of all three IgG subclasses in sera from wt BXSB.Yaa mice showed the expected progressive increases over time with elevations in levels of IgG2b being characteristically most prominent (Fig. 2A). Sera from DKO mice showed a similar pattern, except that significant increases in the levels of each isotype were apparent earlier (by 4 wk of age) and more substantial at all time points examined (Fig. 2A). We also quantified the levels of IgG1 and IgG2b in sera from 14-wk-old Yaa B2m−/− and B6Y mice and found them not to be significantly different (Fig. 2B). This discrepancy can be explained by the fact that mice deficient in B2M do not express FCGRT and thus are not able to maintain high levels of serum IgGs (8). 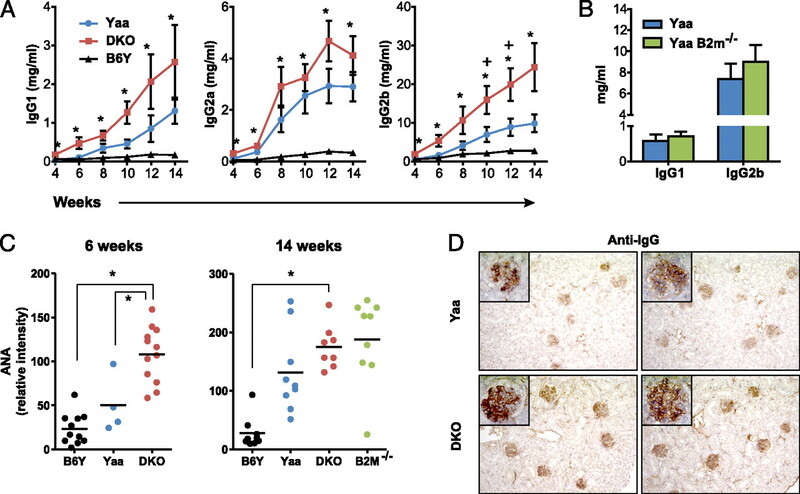 Deficiencies in CD8α/IL-15 and B2M accelerate the development of serologic markers of autoimmunity and Ab-dependent glomerular changes in BXSB.Yaa mice. A, Hypergammaglobulinemia develops precociously and at higher levels in DKO mice. Means ± SEs (SEM) of serially bled B6Y, Yaa, and DKO mice are shown (n = 6–10). B, B2M knockout BXSB.Yaa mice do not exhibit higher serum IgG levels than wt BXSB.Yaa mice (14 wk old, n = 8–9). C, ANAs are elevated in DKO and B2M knockout BXSB.Yaa mice. D, Glomerular deposition of IgG as visualized by anti-IgG labeling is increased in DKO Yaa mice (two representative examples from 14-wk-old mice: original magnification ×20; inset, original magnification ×100). *p < 0.05 for Yaa DKO versus B6Y, +p < 0.05 for DKO versus Yaa. We next compared sera from these strains for levels of ANA, with high-level expression being a characteristic feature of BXSB.Yaa mice (10). As expected, levels of ANA in sera of DKO mice were significantly increased at 6 and 14 wk of age (Fig. 2C). ANA levels in sera of 14-wk-old B2M-deficient mice were also increased but more variably, this despite their inability to maintain high levels of serum IgG (Fig. 2C). Comparisons of sera from DKO, B2M-deficient, and wt Yaa mice for staining patterns on HEP-2 cells did not reveal consistent changes indicative of altered ANA specificities (data not shown). Finally, studies of glomerular IgG deposition were consistent with a hastened appearance of “normal” features of BXSB.Yaa autoimmunity that contribute to lethal renal disease (Fig. 2D). To gain further insights into disease-related processes that might be affected by deficiencies in CD8α and IL-15, we first evaluated two disease hallmarks of BXSB.Yaa disease, splenic hypercellularity and monocytosis. Whereas spleen cell numbers were comparable for 6-wk-old mice of all three strains, the numbers for wt and DKO Yaa mice were significantly elevated over those of B6Y mice at 14 wk of age (Fig. 3A). Parallel studies of 14-wk-old mice showed that the proportions of splenic monocytes in DKO mice were significantly increased over levels in the other two strains (Fig. 3B). The development of autoimmune disease in BXSB.Yaa mice is also characterized by significantly increased numbers of splenic CD4+ICOShi T cells as well as activated FAShi B cells (10). Comparisons of the levels of ICOS expression on CD4+ T cells and FAS expression on B cells showed that the density of both markers was significantly increased on cells from 14-wk-old DKO mice (Fig. 3C, 3D). Taken together, these results show that DKO mice retained cardinal features of the prototypic BXSB.Yaa disease while expressing them earlier in life and in a magnified form. Early and magnified development of cellular and histopathologic spleen cell abnormalities in BXSB.Yaa mice lacking CD8α/IL-15. A, DKO mice show increases in total spleen cells. B, Increased proportions of CD11b+Gr1− monocytes. C, Increased levels of ICOS on CD4+ T cells. D, Increased FAS on B cells. n = 4–6. Representative of at least three experiments. E, Immunohistochemical staining of serial sections from spleens from wt and DKO Yaa mice using anti-B220 (EA, EE), anti-CD3 (EB, EF), and anti-CD138 (EC, EG) as well as H&E (ED, EH) at ×10 (EA–EH) and ×100 (EI) magnification (representative sections from 14-wk-old mice). *p < 0.05 for DKO versus B6Y, +p < 0.05 for DKO versus Yaa. We next determined if DKO mice exhibited histopathologic features of the BXSB.Yaa disease. Serial sections from spleens from wt and DKO mice were stained to localize B220+ B cells, CD3+ T cells, and CD138+ plasma cells and plasmablasts (Fig. 3E). Follicular B cells staining strongly for B220 were more prominent in the spleens of wt mice and more often retained a follicular organization (Fig. 3EA, EE). The normal organization of CD3+ T cells in periarteriolar lymphoid sheaths was altered in the majority of follicles in mice of both genotypes, with scattered follicular distributions being most characteristic (Fig. 3EB, EF). The most striking features of spleens from both wt and DKO cohorts were large extrafollicular accumulations of CD138+ cells (Fig. 3EC, EG). Sections of spleens from both strains stained with H&E showed first that these accumulations were comprised of mixtures of fully mature plasma cells and plasmablasts (Fig. 3ED, EH) and second that the number and size of these accumulations was greater in age-matched DKO mice (Fig. 3EC, ED, EG–EI). Extrafollicular accretion of plasmablasts has been shown to occur spontaneously in certain autoimmune strains of mice (26–28). The results presented in this study document the remarkably robust extrafollicular plasma cell/plasmablast response that develops in BXSB.Yaa mice and are also consistent with a CD8/NK cell axis restraining these pathological processes. We then performed gene expression profiling by qPCR to determine if the transcriptional signature normally associated with spleen cells of BXSB.Yaa mice was altered in DKO mice. Previous studies showed that disease progression in BXSB.Yaa mice is associated with marked increases in B cell transcripts for IgG1, IgG2b, IgG3, and the T follicular helper cell (TFH)-like signature of Il21 and Il10 but, importantly, not for Il17 (10). In this study, comparisons of transcript levels for these genes in spleen cells from 14-wk-old wt Yaa and B6Y mice showed the expected elevations for Yaa mice (Fig. 4A). Parallel studies of the DKO cohort mirrored this pattern, but the levels of expression were increased even more dramatically than for wt Yaa mice. Importantly, comparisons of wt Yaa or DKO mice with B6Y mice revealed no significant differences in the transcript levels of Il17a and Il23a, indicating that the accelerated disease of DKO mice could not be ascribed to a shift toward an inflammatory signature involving Th17 cells. A, Spleen cells from DKO mice express higher levels of Il21, Il10, and IgG. RNA prepared from spleens of four 14-wk-old B6Y, Yaa wt and Yaa DKO mice were evaluated by qPCR. The data were computed using the global pattern recognition normalization algorithm (17). Fold changes at p < 0.05 in comparison with B6Y are noted with an asterisk. B, IL-21 signaling is required for the early mortality of DKO mice. DKO Il21r+/−, n = 14; Il21r+/−, n = 15. p < 0.001. C, IL-21 signaling is required for the early mortality of B2m−/− BXSB.Yaa mice. B2m−/−Il21r+/−, n = 8; Il21r−/−; n = 12. *p < 0.001. The results described above reinforce the suggestion that the accelerated mortality of DKO mice results from the same ICOS+CD4+ T cell-dependent IL-21–driven disease that characterizes wt Yaa mice (10). A specific predication to be drawn from this postulate is that the diseases of DKO and, by extension, B2M-deficient Yaa mice would remain critically dependent on signaling by IL-21 through the IL-21R. To directly test this hypothesis, we studied the survival of DKO and B2M-deficient BXSB.Yaa mice either heterozygous or homozygous for a null mutation of Il21r (Fig. 4B, 4C). Whereas IL-21R–competent DKO and B2M-deficient Yaa mice exhibited early and extensive mortality, IL-21R–deficient mice of both genotypes remained healthy and survived an observation period of 40 wk. The demonstrations that the genetic elimination of the CD8+ T and NK cells resulted in accelerated expansion of TFH with an intact IL-21 polarization program and that the development of profound autoimmunity in these mice remained critically dependent on IL-21 signaling provide further support for an important role for CD8/NK suppressor cells in controlling the prototypic BXSB.Yaa disease. An increasing body of evidence supports the involvement of CD8+ regulatory T cell (Treg) populations in controlling autoimmune and alloimmune disorders (reviewed in Ref. 29). This prompted us to characterize the CD8+ T cells of Yaa and B6Y mice by flow cytometry. A discriminating feature shared by prototypic CD4+ Tregs and certain CD8+ Treg populations is the expression of Foxp3 and/or CD25 (29). 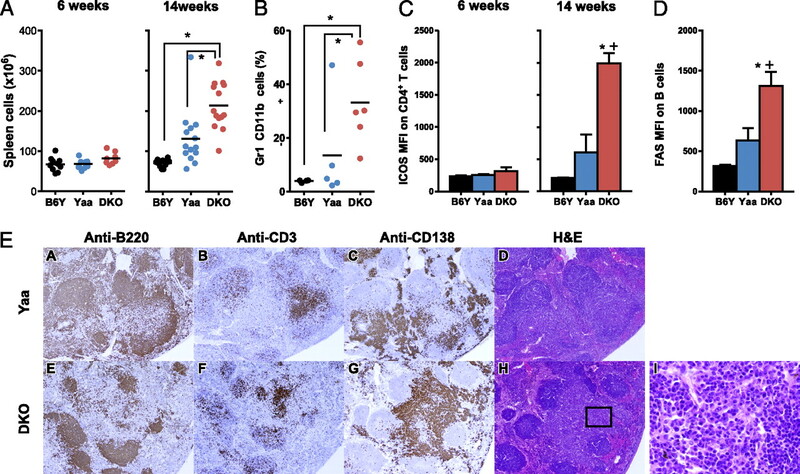 Comparative analyses of 14-wk-old mice revealed that the frequency of Foxp3+CD25+CD4+ cells was significantly increased in the spleens of Yaa as compared with B6Y mice (Fig. 5A). In contrast, very few CD8+ Foxp3+CD25+ cells were found in mice of either genotype. Other studies have characterized a CD8+ Treg population that expresses CD122, the IL-2R β-chain, and exhibits properties of memory cells (30, 31). Studies of spleen cells from the same 14-wk-old mice as examined in Fig. 4A revealed a bimodal pattern of CD122 expression on CD8+ T cells from Yaa mice (Fig. 5B, left panel), with levels of expression being significantly higher than for cells from B6Y mice (Fig. 5B, right panel). BXSB.Yaa mice develop a novel population of splenic CD8+ memory T cells. A, Cells expressing Foxp3 and CD25 are increased among CD4+ but not CD8+ T cells of BXSB.Yaa as compared with BXSB.B6Y mice. B, CD8+ T cells expressing elevated levels of CD122 are expanded in BXSB.Yaa as compared with BXSB.B6Y mice. C, The expanded population of CD122+ CD8+ T cells in BXSB.Yaa mice coexpresses IL-15Rα. D and E, CM (CD44hiCD62hi) CD8+ T cells expressing CD122 are expanded in BXSB.Yaa mice. F, A subset of the CD122+ CD8+ T cell population expanded in BXSB.Yaa mice expresses Ly49. Except where indicated, the samples were from groups of 14-wk-old mice. Results shown are representative of two to three experiments. n = 4 to 5. *p < 0.05, **p < 0.01. The demonstrated importance of IL-15 to disease resistance, and the fact that CD122 is also the β-chain of the IL-15R, prompted us to compare the expression of both the CD122 and IL-15α components of IL-15R on CD8+ T cells of BXSB.Yaa and BXSB.B6Y mice. As would be expected for cells expressing the IL-15R, there was a tight correlation between the levels of CD122 and IL-15Rα expression on splenic CD8+ T cells for BXSB mice of both genotypes (Fig. 5C). Although expression of CD122 and IL-15Rα was slightly higher on cells from 6-wk-old Yaa as compared with B6Y mice, expression of both markers as significantly and coordinately increased on CD8+ T cells from 14-wk-old Yaa mice (Fig. 5C). Further analyses showed that Yaa CD8+ T cells were enriched in the subset of CD44hiCD62Lhi central memory (CM) CD8+ T cells (Fig. 5D) and that the levels of CD122 expression on CM cells were significantly higher than for the comparable subset of cells in B6Y mice (Fig. 5E). This phenotype bears remarkable similarity to that of CD122+CD44+Ly49+CD8+ Tregs described recently by Kim et al. (31) in mice mutant in QA1. 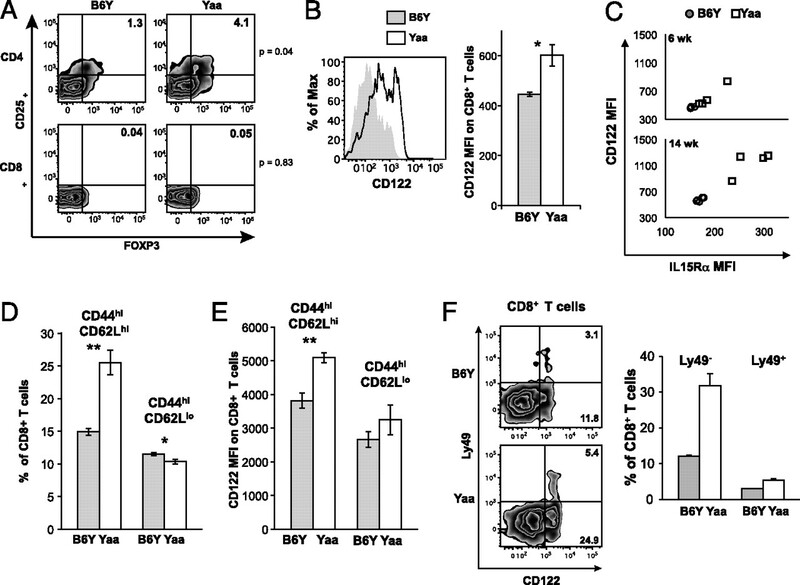 Further analyses of BXSB CD8+ T cells showed that Ly49 was uniquely expressed by a subset of CD122hi CD8+ T cells from both B6Y and Yaa mice (Fig. 5F). These Ly49+ subsets exclusively expressed the CM phenotype (data not shown). The substantial expansion of CM CD8+ T cells expressing both components of IL-15R by Yaa mice is consistent with their dependence on IL-15, and the expression of Ly49 by a subset of these cells is consistent with the involvement of the Ly49+ subset in the suppression of autoimmune disease (31). To determine if the suppressive functions of the CD8/NK axis uncovered in studies of the autoimmune disease of BXSB.Yaa mice might also be active in other CD4+ T cell-driven B cell diseases, we used similar approaches to study B cell lymphoma-prone SJL/J mice. Earlier studies of female mice of this strain demonstrated that they develop mature B cell lineage neoplasms of GC or post-GC origin beginning at <1 y of age and with a penetrance approaching 100% by 2 y of age (32–34). Development and progression of disease are both critically dependent on MHC class II and CD4+ T cells (35, 36). To determine if MHC class I molecules play a role in lymphoma development or progression, we produced SJL mice that carried null alleles of B2m, Cd1d1, Fcgrt, Cd8a, and Prf1 and followed them for survival. In our colony, 95% of wt SJL mice survived to 50 wk of age (Fig. 6A). Paralleling our studies of BXSB.Yaa mice, the mortality of SJL mice deficient in B2M was greatly accelerated, with a mean survival of ∼42 wk. Perhaps predictably, the introduction of null alleles for Cd1d1 or Fcgrt had no significant effects on survival (data not shown). In the light of our studies of BXSB.Yaa mice deficient in these genes, these results are consistent with a role for the CD8/NK axis in suppressing mortality of SJL mice. Development of B cell lineage lymphomas is greatly accelerated in SJL/J mice with a genetically compromised CD8/NK axis. A, Absence of B2M as well as CD8α and PRF1 result in accelerated mortality of SJL mice, but deficiency in IL-15 has no effect. *B2m−/− versus wt or Il15−/−, p < 0.01; B2m−/− versus Cd8a−/−, p = 0.0512; Cd8a−/− versus Prf1−/−, p = 0.0427 (Bonferroni corrected). Cohort sizes: SJL wt, n = 54; B2m−/−, n = 49; Cd8a−/−, n = 41; Il15−/−, n = 53. All data are from female mice. B, B2m-deficient SJL mice develop clonal B cell lymphomas. DNAs from enlarged spleens or lymph nodes of SJL B2m−/− mice 26–28 wk of age were hybridized with probes to IghJ, Tcrb, and ecotropic MuLV envelope-specific sequences. Red arrowheads denote rearranged bands in IgH and Tcrb and newly somatically acquired clonal integrations of ecotropic MuLV. GL, germline locus. Bonferroni corrected significance values: *significant versus SJL wt at p < 0.01, +significant at p < 0.05, ++significant at p < 0.01. To further test this postulate, we studied SJL mice bearing null alleles of Cd8a and Prf1 (Fig. 6A). The survival curve for mice deficient in CD8α fell between that of wt and B2M-deficient mice, again suggesting that of CD8+ T cells along with other MHC class I-dependent cells extend the survival of SJL mice. (The impact of null alleles of MHC-linked Tap1 and H2-K/D could not be studied because SJL mice carry the H2s haplotype, whereas the Tap1 and H2-K/D-knockout alleles are H2b.) The survival curve for perforin-deficient mice was similar to that of mice deficient in CD8α, suggesting that the overall protective effects conferred by B2M were largely, but not completely, perforin dependent. Finally, we examined the effects on survival of SJL mice deficient in expression of IL-15. Unexpectedly, this deficit had no effect on survival (Fig. 6A), indicating that IL-15 plays no obvious role in protecting SJL mice from early mortality. It was important to determine if the accelerated mortality exhibited by SJL mice with a compromised CD8/NK axis was attributable to the mature B cell lineage lymphomas characteristic of wt SJL mice or to other pathologies. As a first approach, we compared the histopathologic features of moribund wt SJL mice and SJL mice deficient in B2M or CD8α. In keeping with previous studies of wt SJL mice (32, 37), mice of all three genotypes were diagnosed histologically with a spectrum of B cell lineage neoplasms including follicular lymphoma, diffuse large B cell lymphoma, plasmacytoma, and, in addition, histiocytic sarcoma (data not shown). To determine if the histologically defined lymphomas of B2M- and CD8α-deficient mice were clonal, as documented previously for B cell malignancies of wt SJL mice (37), we studied the genomic organization of IghJ, Tcrb, and ecotropic MuLV envelope-specific sequences by Southern blot hybridization of DNAs prepared from enlarged spleens or lymph nodes of necropsied mice. Clonal or oligoclonal rearrangements of IgH genes were identified in all but one of six mice examined (Fig. 6B). In four cases, there was equimolar density of two dominant IgJH-hybridizing bands, suggesting the expansion of a single clone that had rearranged both IgH alleles. Hybridization using a probe for the Tcrb locus identified one case with two rearranged bands, which could be indicative of coexisting T cell and B cell lineage lymphomas or, more likely, of a nonfunctional TCR gene rearrangement in a B cell lineage neoplasm. Limited clonality was further supported by the patterns of somatic ecotropic MuLV insertions (Fig. 6B). Thus, both histopathologic and molecular studies are consistent with the conclusion that genetic weakening of the CD8/NK axis leads to accelerated development of clonal B cell malignancies characteristic of wt SJL mice. The normal T cell-dependent B cell response must elicit effective immunity while minimizing collateral damage to the host. Loss of control over this finely tuned system can emerge by the failure of a number of regulatory mechanisms that must balance immune system development and activation in a manner that limits autoreactivity and pathological potential. The goal of this study was to evaluate the potential roles for regulatory mechanisms governed by MHC class I proteins in these processes. We chose to study two models, the severe SLE-like disorder in BXSB.Yaa mice and terminal mature B cell lymphomas in the SJL mice, both of which develop as the result of uncontrolled autoreactive B cell responses driven in a CD4+ T cell-dependent manner. Our approach relied on analyses of survival using experimental cohorts sized to ensure robust discriminative power sufficient to detect even subtle effects. To further maximize the cross-comparability of survival data, environmental variation was kept to a minimum by performing all studies in a consistent husbandry environment. We first assessed the effects on survival of a deficiency in B2M, a genetic manipulation that obviates expression of the great majority of MHC class I family proteins. The most striking result was that BXSB.Yaa and SJL mice deficient in B2M developed much more aggressive and lethal forms of the distinct diseases that characterize these strains. These results agree with previous findings in the (NZB × NZW)F1 SLE model disease (38). In contrast, studies of B2M-deficient MRL.Faslpr and MRL.Fas+ mice showed a reduction in markers of disease, including hypergammaglobulinemia and ANA (39, 40). However, it is worth noting that other disease phenotypes of MRL.Faslpr mice, including vasculitis and dermatitis, were exacerbated in B2M-deficient MRL.Faslpr mice (40), findings consistent with a protective role for B2M in these pathological processes. Discrete deficiencies in the MHC class Ib family members FCGRT and CD1D1 did not measurably impact the lifespans of BXSB.Yaa and SJL mice. Studies of mice deficient in FCGRT support a role for this protein in the exacerbation of humorally mediated autoimmune processes (7, 41–43). Studies of CD1D1-deficient (NZB × NZW)F1 mice and pristane-treated BALB/c mice contrast with our findings in that the severity of SLE-like disease was significantly exacerbated (44, 45). The varied phenotypic effects on different disease parameters as well as different autoimmune models are certain to reflect the pleiotropic nature of B2M on its MHC family partner proteins as well as the genetic heterogeneity of mouse models of autoimmunity and, likely, of human autoimmune diseases as well. Given this pleiotropy, the overriding phenotype of protection from more lethal forms of the distinct diseases of BXSB.Yaa and SJL mice that we report is remarkable. Several convergent lines of evidence indicate that the accelerations of disease and mortality seen in B2M-deficient mice of these and related genetic backgrounds can be ascribed to a marked weakening of a normally potent CD8/NK suppressor axis. First, the development of severe autoimmune disease in (NZW × BXSB.Yaa)F1 mice was accelerated in mice depleted of CD8+ T cells by treatment with anti-CD8 mAb (46). Second, weakening of this axis caused by deficiencies in CD8α, TAP1, and H2K/D in BXSB.Yaa mice and in CD8α in SJL mice resulted in acceleration of their diseases. Third, BXSB.Yaa mice deficient in IL-15, a cytokine that supports both NK cells and memory CD8+ T cells (24, 25), exhibited a similar acceleration of disease. Finally, as illustrated most forcefully by studies of BXSB.Yaa mice deficient in both CD8α and IL-15, crippling of this axis resulted not only in the halving of lifespans but also in the precocious development of an autoimmune disease that is very similar to that found in B2M-deficient mice and is phenotypically indistinguishable from the more protracted disease characteristic of wt BXSB.Yaa mice. The commonalities between the accelerated disease of CD8α/IL-15–deficient DKO mice and the more protracted wt BXSB.Yaa disease are exemplified by the transcriptional signature that they share, including upregulated class-switched IgG isotypes and the canonical CD4+ TFH cytokines Il21 and Il10. In addition, the strict requirement for IL-21 signaling, previously shown to be critical for the autoimmune disease of wt BXSB.Yaa mice (10), was mirrored by absolute dependence on signaling through the IL-21R for the accelerated diseases of DKO and B2M-deficient BXSB.Yaa mice. Finally, the precocious appearance of ICOShiCD4+ T cells, activated B cells, elevated serum levels of IgG and ANAs, and the accumulation of extrafollicular plasmablasts and plasma cells all lead us to conclude that the CD8/NK axis, absent in DKO mice, is highly proficient at retarding the earliest stages of disease. We note, however, that the eventual development of autoimmunity in BXSB.Yaa mice, as well as lymphomas in SJL mice, indicate that this suppression is eventually overwhelmed, either by exhaustion of the regulatory population(s) or by their failure to cope with progressively expanding numbers of target cells. Parallels between the CD8 component of the regulatory CD8/NK axis described in our studies and CD8+ Tregs previously shown to influence a range of autoimmune disorders are readily apparent (reviewed in Ref. 47). Although the phenotypes of CD8+ Tregs vary greatly both in rodent models and humans, certain populations express CD122 (29–31, 48, 49). The expanded population of CD122+IL-15Rα+CD8+ T cells detected in spleens of BXSB.Yaa mice as early as 6 wk of age also expressed markers characteristic of CM CD8+ T cells. This putative CD8+ Treg population, which does not express Foxp3, is remarkably similar to a recently described population of CD122+CD44+CD8+ Tregs that are dependent on expression of the MHC class Ib molecule QA1 and on IL-15 for their development and function (31, 49). These naturally arising CD8+ Tregs are thought to respond through their TCR to QA1-bound QDM-like peptides. They also exert perforin-mediated cytotoxic activity against TFH (31, 49), a cell type that is a key source of IL-21 that drives BXSB.Yaa disease (10). Taken together, these findings are most consistent with the active involvement of these CD8+ Tregs, driven by IL-15 and operating at least partially by perforin-mediated lysis, to eliminate autoreactive IL-21–expressing TFH-like cells that drive the severe SLE-like syndrome of BXSB.Yaa mice. We note that the survival of BXSB.Yaa mice deficient in TAP1 or CD8α alone, or doubly deficient in TAP1 and CD8α, were all shortened to nearly the same extent (Supplemental Fig. 1A). The failure of TAP1 and CD8α deficiencies to complement suggests that the development and/or function of this CD8+ Treg population is dependent on peptides processed by the TAP pathway. Although the above arguments support the involvement of suppressor CD8+ Tregs in controlling the BXSB.Yaa disease, the highly aggressive autoimmune phenotype of B2M-deficient BXSB.Yaa mice was fully recapitulated only in mice lacking both CD8α and IL-15. This result implies that MHC class I-dependent, IL-15–dependent suppressor cells not accommodated within the CD8+ Treg paradigm also contributed to disease suppression. One possible explanation for this observation is based on the fact that MHC class I-restricted T cells that resemble conventional CD8+ T cells (CD8 T cell “wannabes”) develop and function in CD8α-deficient mice (50, 51). The IL-15–dependent disease restriction observed in the absence of CD8+ T cells may be mediated by CD8+ T cell wannabes with suppressor activity. Alternatively, the IL-15 dependence of suppression found even in the absence of CD8+ T cells may be attributed to conventional NK cells. NK cells dependent on MHC class I molecules are greatly reduced in IL-15–deficient mice and operate through a balance of stimulatory and inhibitory innate receptors (24, 25). Activated and potentially stressed lymphocytes that promote autoimmune disease may induce effector function of NK cells. It is noted that the reconstitution of a B2M-deficient mice with a human B2M transgene (TG) only partially recapitulates the disease resistance observed with wt BXSB.Yaa mice (Supplemental Fig. 1B), despite the fact that the human (h)B2M TG allows for robust positive selection of CD8+ T cells (52). Human β2-microglobulin impairs the recognition of mouse MHC class I proteins by Ly49 (53, 54). The inability of hB2M TG mouse B2M-deficient BXSB.Yaa mice to fully recapitulate the disease phenotype B2M-competent BXSB.Yaa mice is consistent with the involvement of Ly49 as well as conventional NK cells in suppression of autoimmunity in ways that are not currently understood. Similar to the SLE-like disease of BXSB.Yaa mice, the late-onset, mature B cell lymphomas of SJL mice develop as a consequence of MHC class II-dependent interactions between autoreactive CD4+ T cells and B cells. The increased risk for the development of B cell non-Hodgkin's lymphoma in patients with SLE is suggestive of overlapping mechanisms in the pathogenesis of these disorders (55–57). Our findings that a CD8/NK axis normally restricts the development of both autoimmunity and lymphomas provide another unifying link between these disorders and, by extension, the potential of common strategies for intervention. However, a significant difference between the mechanisms governing disease suppression in BXSB.Yaa and SJL mice is that IL-15 retarded the development of BXSB.Yaa autoimmunity but not the development of SJL lymphomas. We interpret these differing results to indicate that the cytokine signals that drive the suppressor CD8/NK axis can vary dependent on the nature of the pathological processes and, quite likely, the genetic compositions of the hosts. Finally, the demonstrated activity of a potent CD8/NK axis in both models of MHC class II-dependent, CD4+ T cell-driven B cell diseases causes us to reconsider the factors that determine autoimmunity and lymphoma. As best exemplified in our detailed studies of BXSB.Yaa mice but extending to the SJL lymphoma-prone mice, any of a variety of mutations that weaken the CD8/NK axis (e.g., the null alleles of Cd8a, H-2K/D, Tap1, Prf1, and Il15 studied in this paper) result in a clinical readout of accelerated and more profound autoimmune disease or precocious development of lymphomas. Given the potent, suppressive effect of the MHC class I-dependent CD8/NK axis described in this study, any number of genetic or environmental factors that weaken this suppressor axis may shift the tenuous balance toward disease. 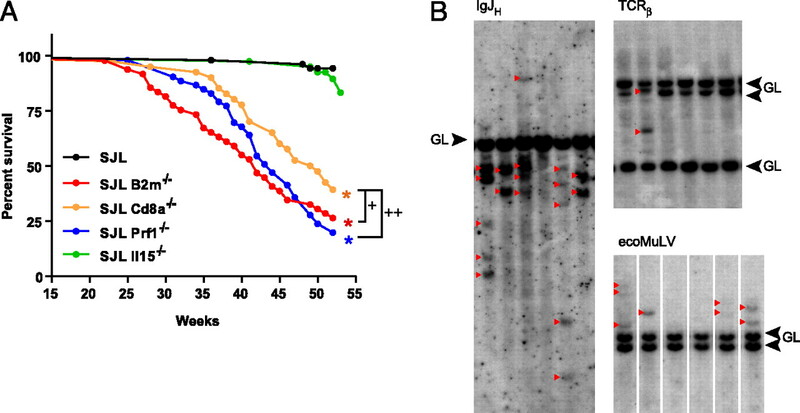 We thank Janet Hartley for critical review of this manuscript, Sharon Roopenian and Gregory Christianson for excellent technical assistance, and Susir K. Challopadhyay for performing the Southern blot. This work was supported by grants from the National Institutes of Health and the Alliance for Lupus Research (to D.C.R.). C.G.M. was supported partially by a National Institutes of Health training grant. J.A.B. was supported by the Arthritis Foundation. This work was also supported in part by the Intramural Research Program of the National Institutes of Health, National Institute of Allergy and Infectious Diseases (to D.-M.S. and H.C.M.).
. 2004. Qa-1 restriction of CD8+ suppressor T cells. J. Clin. Invest. 114: 1218–1221.
. 2008. Qa-1/HLA-E-restricted regulatory CD8+ T cells and self-nonself discrimination: an essay on peripheral T-cell regulation. Hum. Immunol. 69: 721–727.
. 1997. CD1d1 mutant mice are deficient in natural T cells that promptly produce IL-4. Immunity 6: 469–477.
. 2008. Dependence of antibody-mediated presentation of antigen on FcRn. Proc. Natl. Acad. Sci. USA 105: 9337–9342.
. 2007. FcRn: the neonatal Fc receptor comes of age. Nat. Rev. Immunol. 7: 715–725.
. 2003. The MHC class I-like IgG receptor controls perinatal IgG transport, IgG homeostasis, and fate of IgG-Fc-coupled drugs. J. Immunol. 170: 3528–3533. Hematopathology subcommittee of the Mouse Models of Human Cancers Consortium. 2002. Bethesda proposals for classification of lymphoid neoplasms in mice. Blood 100: 246–258.
. 2010. The histopathologic and molecular basis for the diagnosis of histiocytic sarcoma and histiocyte-associated lymphoma of mice. Vet. Pathol. 47: 434–445.
. 1999. Splenic marginal zone lymphomas of mice. Am. J. Pathol. 154: 805–812.
. 1982. On immunoglobulin heavy chain gene switching: two gamma 2b genes are rearranged via switch sequences in MPC-11 cells but only one is expressed. Nucleic Acids Res. 10: 611–630.
. 1985. Rearrangement and transcription of a T-cell receptor beta-chain gene in different T-cell subsets. Proc. Natl. Acad. Sci. USA 82: 531–535.
. 1980. Structure of endogenous murine leukemia virus DNA in mouse genomes. Proc. Natl. Acad. Sci. USA 77: 5774–5778.
. 2003. Customized molecular phenotyping by quantitative gene expression and pattern recognition analysis. Genome Res. 13: 1719–1727.
. 1978. Spontaneous murine lupus-like syndromes. Clinical and immunopathological manifestations in several strains. J. Exp. Med. 148: 1198–1215.
. 1979. A Y chromosome associated factor in strain BXSB producing accelerated autoimmunity and lymphoproliferation. Arthritis Rheum. 22: 1188–1194.
. 1982. Suppression of transferred BXSB male SLE disease by female spleen cells. J. Immunol. 128: 1805–1808.
. 2001. The role of alpha beta+ T cells and homeostatic T cell proliferation in Y-chromosome-associated murine lupus. J. Immunol. 167: 2354–2360.
. 1998. Major histocompatibility complex (MHC) class I KbDb -/- deficient mice possess functional CD8+ T cells and natural killer cells. Proc. Natl. Acad. Sci. USA 95: 12492–12497.
. 2000. Control of homeostasis of CD8+ memory T cells by opposing cytokines. Science 288: 675–678.
. 2002. Evolution of autoantibody responses via somatic hypermutation outside of germinal centers. Science 297: 2066–2070.
. 2008. ICOS-dependent extrafollicular helper T cells elicit IgG production via IL-21 in systemic autoimmunity. J. Exp. Med. 205: 2873–2886.
. 2010. CD8+ Tregs in lupus, autoimmunity, and beyond. Autoimmun. Rev. 9: 560–568.
. 2008. Are CD8+CD122+ cells regulatory T cells or memory T cells? Hum. Immunol. 69: 751–754. 1963. SJL/J, a new inbred strain of mouse with a high early incidence of reticulum-cell neoplasms. Proc. Am. Assoc. Cancer Res. 4: 46. 1983. Hodgkin’s disease. SJL/J murine lymphoma. Am. J. Pathol. 110: 393–396.
. 1988. Age-related changes in the morphology and immunophenotype of spontaneous lymphomas of SJL/N mice. J. Pathol. 156: 331–339.
. 1986. In vivo growth inhibition of Ia+ lymphomas in SJL mice treated with I-As-reactive monoclonal antibody. Immunopharmacology 12: 1–9.
. 1990. Influence of T-helper cell specific monoclonal antibody on progressive growth of B-cell lymphomas in SJL/J mice: correlation of acute treatment dosage with tumor dormancy or complete remission in long-term survivors. Cancer Commun. 2: 33–43.
. 1998. Progression of spontaneous lymphomas in SJL mice: monitoring in vivo clonal evolution with molecular markers in sequential splenic samples. Lab. Invest. 78: 1459–1466.
. 2005. MHC class I expression regulates susceptibility to spontaneous autoimmune disease in (NZBxNZW)F1 mice. Lupus 14: 308–314.
. 1996. beta2-microglobulin dependence of the lupus-like autoimmune syndrome of MRL-lpr mice. J. Immunol. 156: 4932–4939.
. 2001. Deficiency in beta(2)-microglobulin, but not CD1, accelerates spontaneous lupus skin disease while inhibiting nephritis in MRL-Fas(lpr) nice: an example of disease regulation at the organ level. J. Immunol. 167: 2985–2990.
. 2004. The MHC class I-like Fc receptor promotes humorally mediated autoimmune disease. J. Clin. Invest. 113: 1328–1333.
. 2008. Neonatal Fc receptor deficiency protects from tissue injury in experimental epidermolysis bullosa acquisita. J. Mol. Med. 86: 951–959.
. 2005. Complete FcRn dependence for intravenous Ig therapy in autoimmune skin blistering diseases. J. Clin. Invest. 115: 3440–3450.
. 2007. Examining the role of CD1d and natural killer T cells in the development of nephritis in a genetically susceptible lupus model. Arthritis Rheum. 56: 1219–1233.
. 2003. Immunoregulatory role of CD1d in the hydrocarbon oil-induced model of lupus nephritis. J. Immunol. 171: 2142–2153.
. 1998. Effects of administration of monoclonal antibodies (anti-CD4 or anti-CD8) on the development of autoimmune diseases in (NZW x BXSB)F1 mice. Immunobiology 198: 451–464.
. 2009. Treating autoimmune disease by targeting CD8(+) T suppressor cells. Expert Opin. Biol. Ther. 9: 951–965.
. 2008. Essential role of CD8+CD122+ regulatory T cells in the recovery from experimental autoimmune encephalomyelitis. J. Immunol. 180: 825–832.
. 1997. CD8 lineage commitment in the absence of CD8. Immunity 6: 633–642.
. 2008. Generation of antiviral major histocompatibility complex class I-restricted T cells in the absence of CD8 coreceptors. J. Virol. 82: 4697–4705.
. 1995. Increase in positive selection of CD8+ T cells in TAP1-mutant mice by human beta 2-microglobulin transgene. J. Exp. Med. 181: 787–792.
. 2004. A species-specific determinant on beta2-microglobulin required for Ly49A recognition of its MHC class I ligand. Int. Immunol. 16: 197–204.
. 2005. Influence of xenogeneic beta2-microglobulin on functional recognition of H-2Kb by the NK cell inhibitory receptor Ly49C. J. Immunol. 175: 3542–3553.
. 2010. Incidence of cancer among female patients with systemic lupus erythematosus in Korea. Clin. Rheumatol. 29: 381–388.
. 2005. An international cohort study of cancer in systemic lupus erythematosus. Arthritis Rheum. 52: 1481–1490.
. 2009. Lupus and cancer. Lupus 18: 479–485.